QStar Archive Storage Manager (ASM) manages a range of storage technologies such as Disk Array, Object Storage, Tape Libraries, Optical Disk Libraries, WORM and Cloud (private and hybrid) to form an efficient, safe and cost-effective Active Archive environment by virtualizing differing storage technologies behind a file system. Users see ordinary file shares and can easily search, find and retrieve data directly from the archive. QStar Archive Storage Manager (ASM) creates an Active Archive environment as a standard NAS-based file system using NFS and SMB protocols or S3-based cloud APIs. This flexible and expandable data repository is accessed natively by Unix/Linux or Windows and is handled by all existing applications without changing anything, because the pool of storage resources works just like a standard NAS device. Moreover, the user’s data access experience remains exactly the same. QStar ASM provides a standard POSIX or Windows NTFS file system interface to the storage devices. This gives any local application immediate access to ASM file systems without any modification. In addition it means exports can be made from ASM file systems using standard network protocols like NFS (3, 4), SMB (2, 3), HTTP, FTP and native protocol server operating systems. The subset of the Amazon S3 protocol is provided through the QStar ASM server. QStar ASM also provides SOAP-based web services that allow you to implement user-specific system monitoring and management. 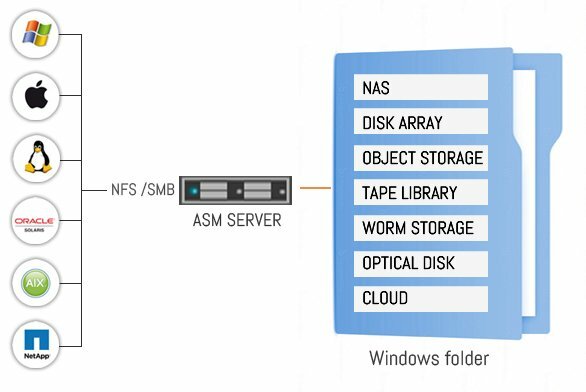 QStar Archive Storage Manager creates an Active Archive environment as a standard NAS-based file system using NFS and SMB protocols or S3-based cloud APIs. Tape Libraries, Object Storage, Cloud Storage (Public, Private or Hybrid), WORM and Optical Libraries are managed transparently like a single point mounting file system or folder. Users see standard file shares and can easily search, find and retrieve data directly from the Active Archive. What exactly does an Active Archive offer compared with a traditional approach? First of all, it offers a secure, high-capacity storage environment that does not require separate backup processes. The benefit of an Active Archive is to make all content available online or near online (in the case of tape libraries) whilst leveraging low-cost storage. The hybrid architecture uses different types of tiered storage (including Cloud) to provide high performance and much lower running costs than standard magnetic disk-based architecture. The QStar Archive Storage Manager introduces a software layer that allows the existing file system to expand over disk and many archive technologies, giving organizations a continuous view of the contents of their archives, making it easier for them to access files whenever needed. Users and applications access storage resources such as Tape Libraries, Object Storage, WORM, Optical Libraries and Cloud from local infrastructures through either NFS, SMB or via HTTP or S3 APIs. Users see standard file shares and can easily search, find and retrieve data directly from the archive. With Archive Storage Manager (ASM) all data stored within Tape Libraries, Object Storage, Cloud Storage (public, private or hybrid) or Optical Libraries is accessed via standard protocols like HTTP or S3 APIs from on–premise IT infrastructures, users and applications, and Cloud Storage resources transparently accessed in native mode through NFS and SMB (users see ordinary file shares). Data access requirements should be a consideration as to what archive technology is to be used. Archive data that is likely to be accessed during its archive life should be stored on random-access media (disk or cloud-based). Where data has little chance of being recalled (infrequent access), it might be better stored on a tape solution. In either case archive solutions can keep the data within a secure network for long periods of time. Data retention is another criterion for considering the archive technology. Removable media has a shelf life and a useable life. Cloud storage relies on the longevity of a third party organization to store and migrate your data to new technology. Data retention regulations will be the driving factor for how long data will reside in the archive and often what archive technology is most suitable. The tape life of data stored on LTO tape is usually quoted as 30 years. However, tape is sensitive to storage conditions, and the life expectancy numbers cited by tape manufacturers assume ideal storage conditions, a constant temperature of about 70° Fahrenheit and 40% relative humidity. QStar Network Migrator (QNM) is a policy-based tiered storage and data lifecycle manager. QNM software uses advanced policy management to monitor and automatically migrate, copy or move less frequently used files from primary storage to tiered storage or to a central archive or Cloud. By migrating static or less frequently used files to lower cost storage such as Tape Libraries or Cloud, businesses can optimize the use of primary storage, reducing the need and costs associated with purchasing more. In addition, when data is managed properly and only the most recent or frequently changing files are included in the backup process, the backup window will be reduced. QStar Network Migrator software can be easily installed on a Windows or Linux server. Agents are available for each server managing data, whether it is Windows, UNIX, Linux or Mac. QNM also supports a variety of API sets to integrate with “closed” file systems.